I'm back with the final two colorways for Finnegan! First is the 'pebble' colorway. This colorway is becoming a semi-regular in my collections - as I love the grounding it brings. I also love the grey-taupe-linen hue it has. For me it's not too light, not too dark,... it's just right. 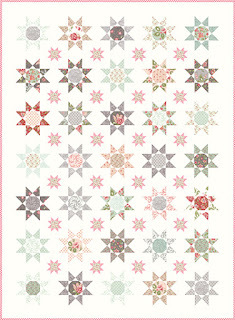 I first used this colorway with Ambleside my first collection for Moda, & I remember a shop owner coming up to me at that Quilt Market telling me they had ordered the entire collection... & that I, "should always include this colorway!". While it hasn't been in every collection, it is one of my favorites. (I know... the girl with all the soft colors... & the pebble colorway is one of my favorites!) In past collections - I've mostly used it as an accent color - but I've always wanted to use it as a background & so for Finnegan - I have a very fun design that uses the 'pebble' colorway for the background!...I can't wait to show you (soon!). So... if the 'pebble' colorway brings a 'grounding' to the collection - then the perfect compliment to that would be the 'sky' colorway. Once again - I've included a soft blue with just a hint of aqua in it. I just love the fresh feel this colorway brings to the collection. If you've ever looked closely - I like to use this color in the tiny little accent flowers of many of my floral designs. I just love the way the 'sky' colorway brings a little bit of sparkle... & a breath of fresh air. Speaking of new quilts... I do have some new designs I am making with my Finnegan collection - & I will be posting those this next week... Hope you can come back to see! Next for the Finnegan colorways, we have lilac & sunny (yellow). I'm so pleased with both these colorways & they have a special place in my heart. And, I couldn't help but name the yellow colorway sunny. I love how it works with all the other colors... so agreeable... so... sunny! So, these two colorways add a special touch for me to my Finnegan collection. I hope you love them to! Blossom (pink) & Sprout (lt. green). 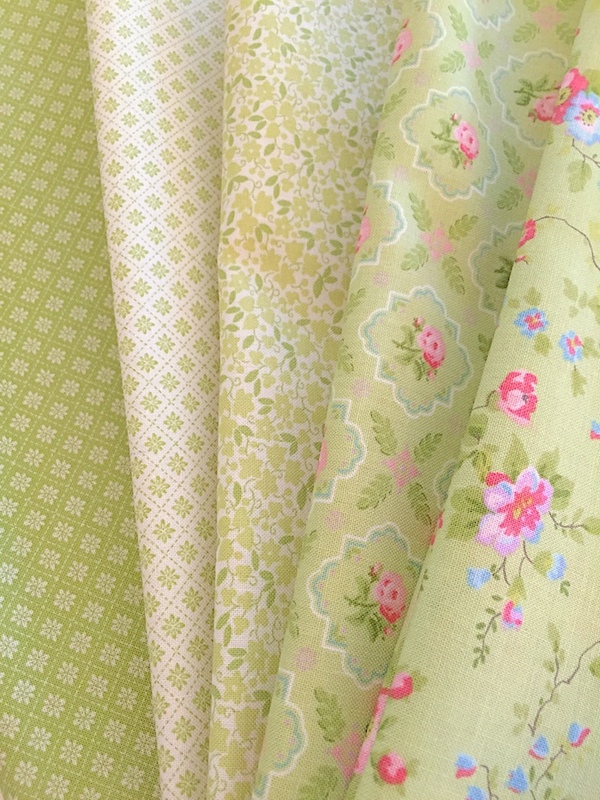 Looking at these makes it feel like you've walked into a spring garden! 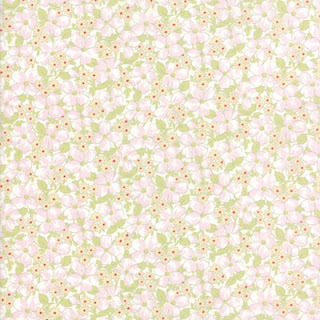 The blossom colorway in Finnegan is a little smaller this time as the pink hue is already on most of the floral prints - regardless of the background. This way - the blossom color is scattered all through the collection - with a few blossom coordinates to accent all the pretty flowers & buds. Hope you're enjoying these Finnegan peeks as much as I am! I don't know if you are aware... but a soft white - or what I call 'linen white' is a staple of all of my fabric collections. It's kind-of like a signature color for me. Also, I love a soft white... (no surprise there, huh?) and so I use it quite a bit. The soft white that is in each of my collections (that I call 'linen white') is actually from Moda's Bella Solids - Off White (9900-200). I use it all the time & I actually have bolts (& bolts) of it in my studio at all times. So, the first colorway for Finnegan I'm sharing is the 'linen white' color. Fresh, clear, clean... There's just something about linen whites! I had a very big (& heavy!) box arrive at my house a few weeks ago… and once again, Moda made it feel like Christmas morning at my house. 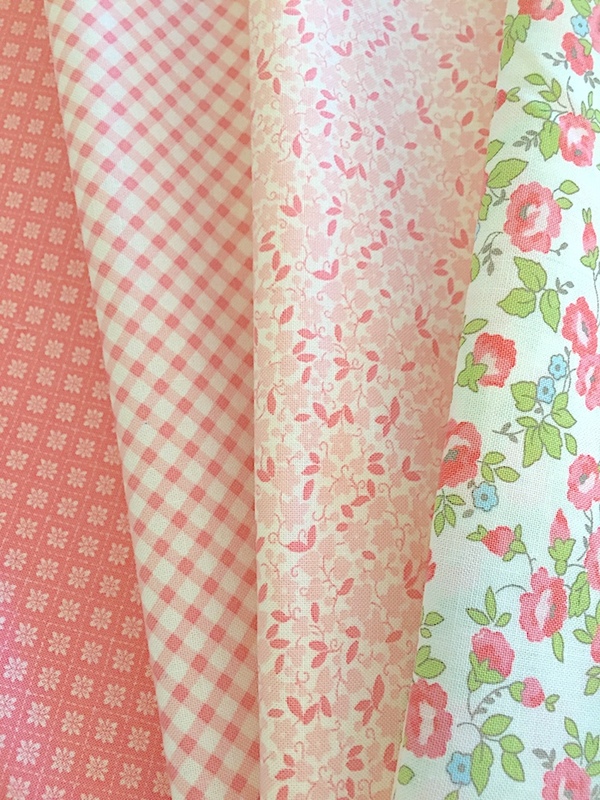 Finnegan is the name for my latest collection for Moda Fabrics, and I have admit, I am a bit smitten with it! There are a couple of prints in this collection that have jumped up high on my all time favorites list.(!) 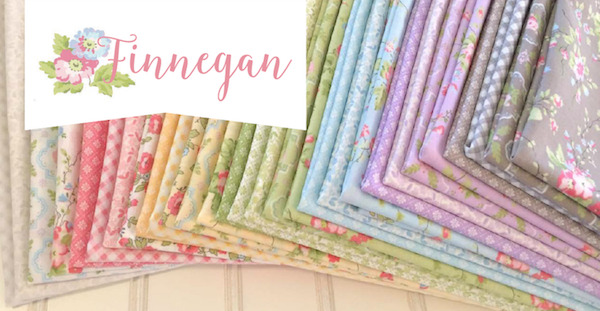 The colors for Finnegan are my classic softer palette - with names like sky, sprout, sunny, lilac, blossom pink, pebble, and of course my classic linen-white. All hues that embrace & celebrate the freshness of spring! What’s been fun for me is how well they work set with not only the linen-white, but I’ve been setting them with the pebble colorway as well & I’m loving how they sparkle on both! Over the next few days, I’ll be sharing some of the new designs & some of the new patterns that are in the works! If there is something that catches your eye… be sure to let your local quilt shop know, as the Moda Reps (yay for the Moda Reps!) are going around to the quilt shops taking orders for what is known as the March collections… (also known as Pre-Spring Market Collections). 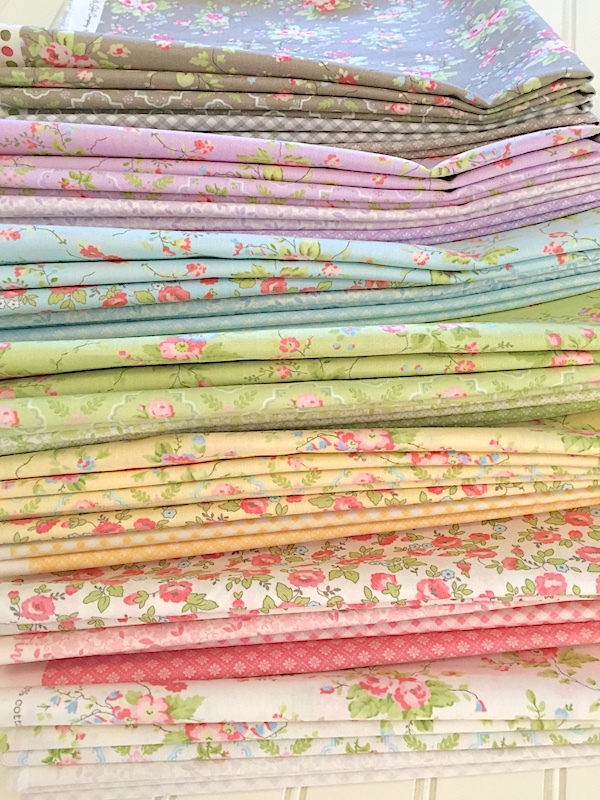 Being part of the Pre-Market collections group is allowing me a little extra time to make all the samples for my new quilt patterns… & for that I am so very thankful! 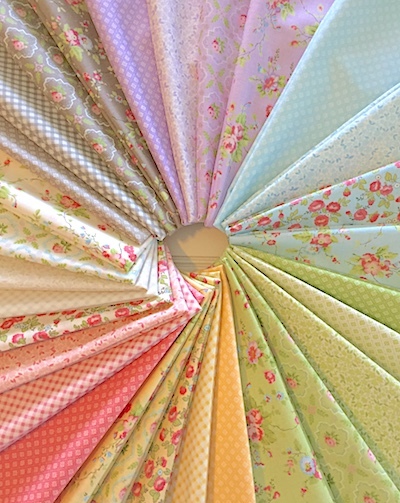 I will have five new quilt designs for you… & I’m having so much fun making them! So please check in again to see more of Finnegan… & the new patterns! Living in the southwest, there are often years when I'm still wearing summer clothes (t-shirt & shorts) into the Christmas season - but this year we've actually needed sweaters for many of the days starting just before Thanksgiving...! I love that - as I really like having at least a little bit of a feeling of difference in the seasons. I've also noticed the leaves on our crepe myrtles are various colors of red, orange, & light green... so pretty & while so many of our trees stay green all year long - it's so nice to have a hint of a seasonal change. So, I got out a little 4 ft. tree I have, but I didn't want to go overboard on the ornaments (some might be to sentimental for him...). 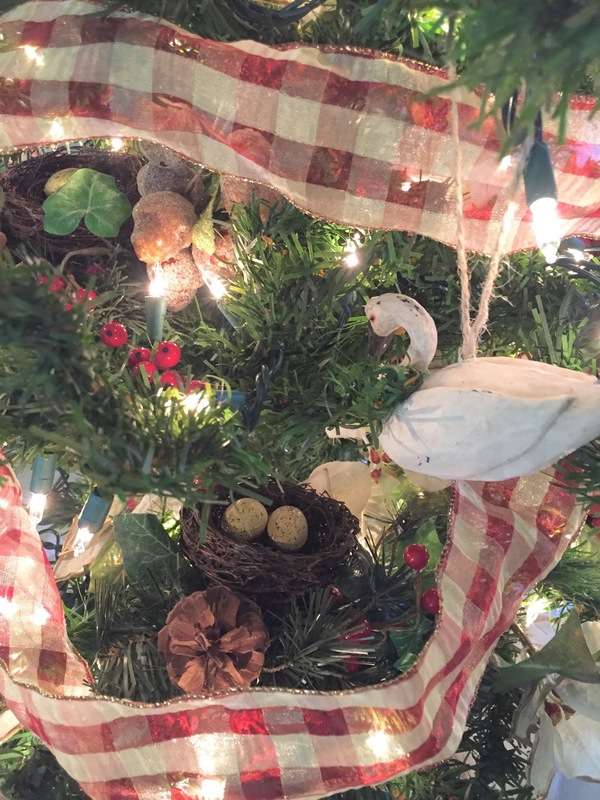 I decided to use some of the more 'nature' inspired pieces I had... some floral picks & some with nests & pinecones, & berries... I also had one that had a little birdhouse - so I used it as the tree-topper. 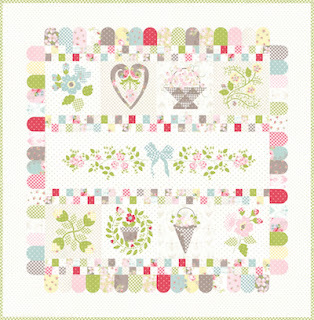 I finished it off with some gingham ribbon I've had for 'ages'... & some swans & of course, acorns! 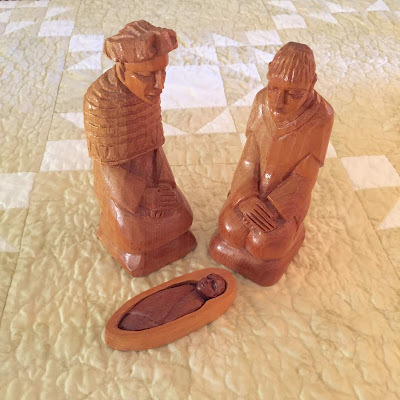 I added a very special hand-carved nativity set that I got when I was on a missions trip to Guatemala. We were in a small mountain town called Barillas - & I purchased them from the man who carved them. I've had other sets - but this one is my favorite. I've put the tree up on the large dining room table (that we don't use that often) - but it can be seen from so many places in the house, (& Dad walks by it every time he comes out of his bedroom...!). 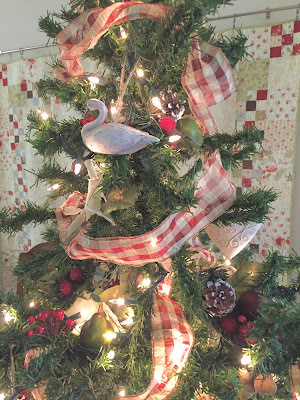 It sits in front of one of my Christmas quilts, & Dad has thanked me several times for putting up the tree & that makes it even more special. 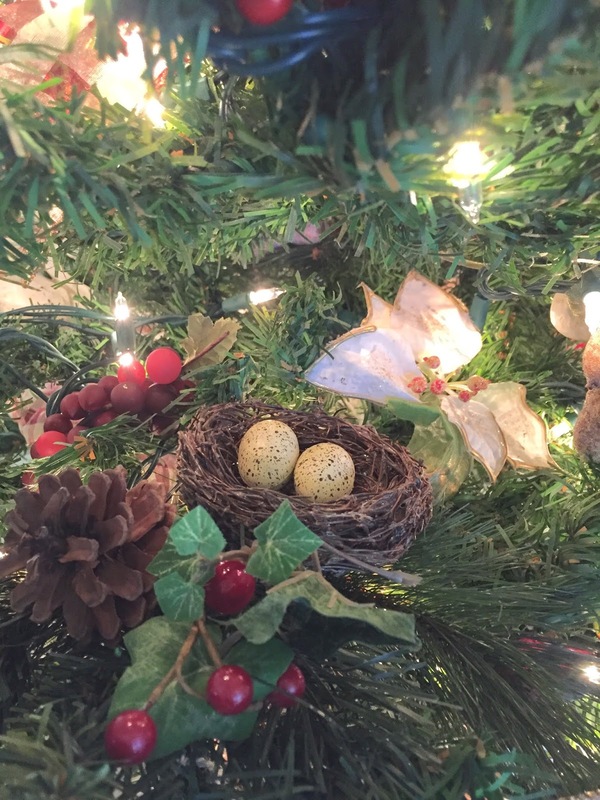 I've missed having a tree up... & this has been the perfect little touch for our simple Christmas decor this year. 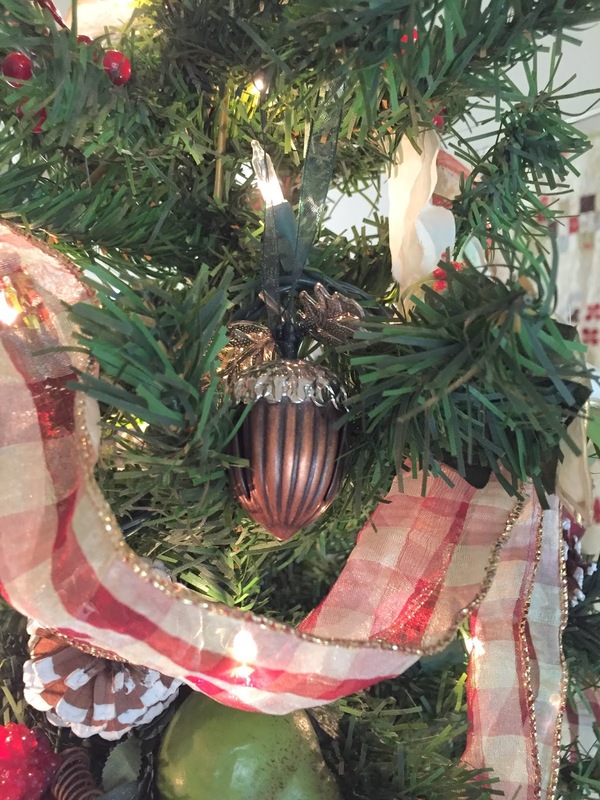 As this season gets busier & busier, I hope you also enjoy the simple & peaceful moments. For me, those are some of the best moments of the season. This has been quite a year... life has definitely been interesting! Days have been filled with changes, beginnings (& endings), & being reminded of how fleeting life can be. It's also been a year where I have been surrounded by the support & encouragement of friends, & family, & for that I am so thankful. 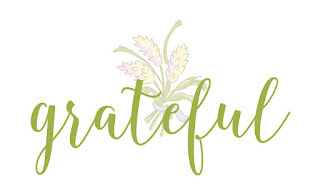 I'm also so grateful that I get to be a part of such a wonderful group of people... & that would be quilters & stitchers... & the fact that I get to design & be a part of these groups is daily such a blessing to me. And... while I'm counting my blessings... I'm counting you! 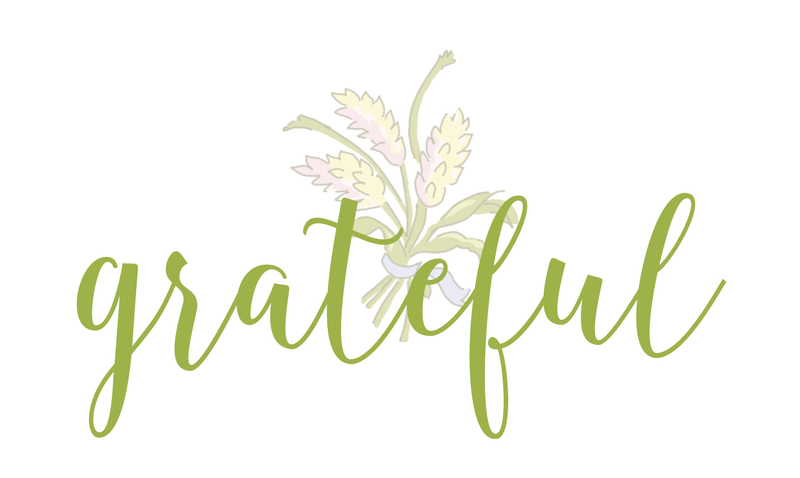 I want to thank you so much for visiting my little blog... especially as I haven't been the best at keeping up with you (something I'm working on!). And, if you've followed me for very long - you know that this time of year - I like to celebrate & show my gratitude with a 'Counting My Blessings' sale on my website... & it's starting today! I've been a busy little bee for the past few days, cutting & cutting & folding & pressing & making over 550 fat quarters (whew!) that have been grouped into fun bundles that can't be found anywhere else! 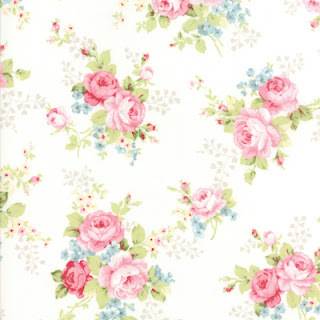 Also, all the patterns, notions, fabrics (yes, there's some yardage added to the website! ), & even the sample quilts are on sale for 15% - 30%! 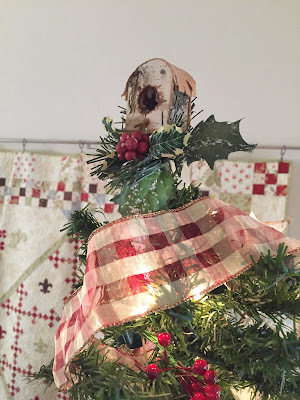 If you would like - I'd love for you to check it out... & find a wonderful gift for yourself or one of your wonderful quilter/stitcher kind of friends that we all love so! 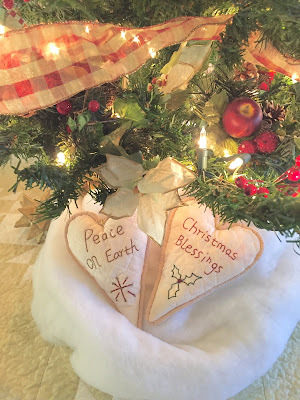 So, before all the flurry of this holiday season takes off this week, I hope you find the time to also look around you & find all those blessings that surround you too! I have always liked Andrea Bocelli & this video of a new song that he is doing with his son Matteo is so good - I just had to share. :: Kits, Kits... we're making new kits! While I'm (slowly) working on the 'Dessert Sampler - Color Cuts' kit that Moda created (I'm making two at one time!... I love it that much!!) - I have come to realize how much I really like having a kit when making a new quilt... Everything you need - all put together for you. It takes a lot of pressure off of having to scout around gathering everything needed. 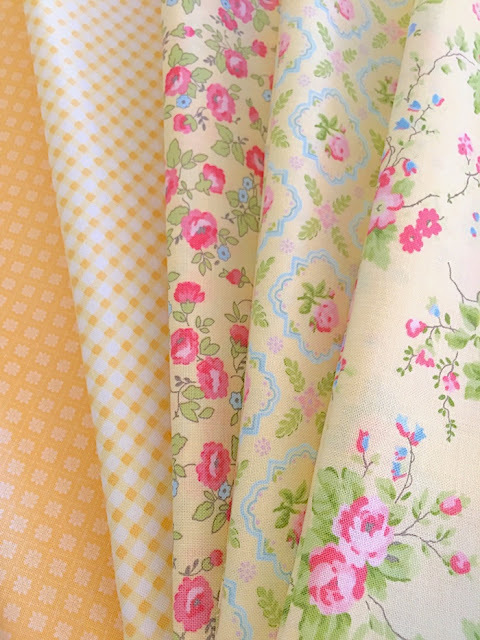 So with my new fabric collection for Moda - 'Amberley' - getting ready to ship next month, I decided to put together some kits for some of the designs I made with Amberley. You can see three of them here in my booth from Spring Quilt Market. To the left is Betsy's Closet & to the right of that is the appliqué version of Floye's Garden. Then on the lower right is the embroidery version of Floye's Garden. (Which will also be coming to the website soon!) 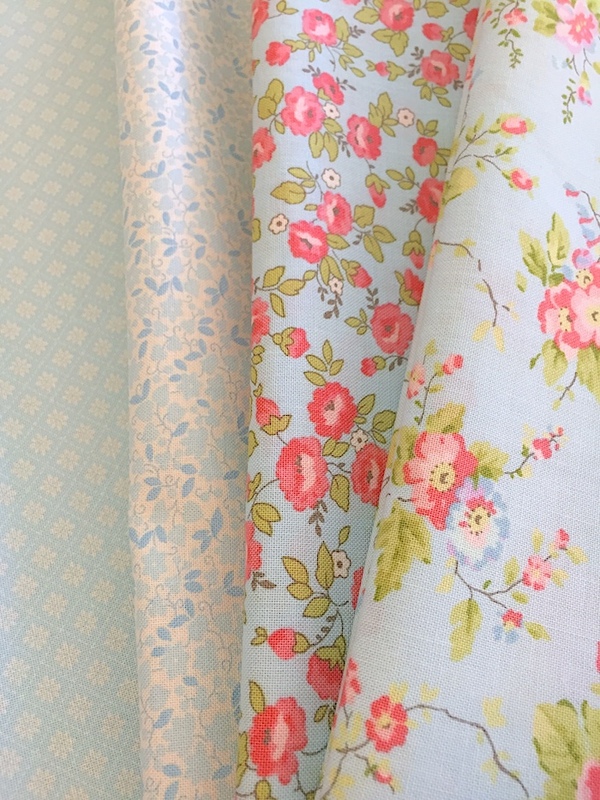 Amberley ships in mid-November & because I've had to order the fabrics months ago... quantities will be limited(!). 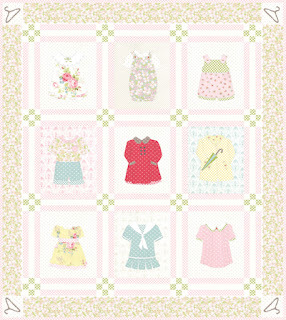 The other kit that I'm putting together is with the upcoming 3 Sister's collection for Moda called 'Porcelain'. I have to admit... once again, I've fallen for a 3 Sister's collection. I wanted to give you the 'heads-up' that I've added three of the new kits the the website. You can secure your kit with a pre-order registration for all three upcoming kits. Oh!... 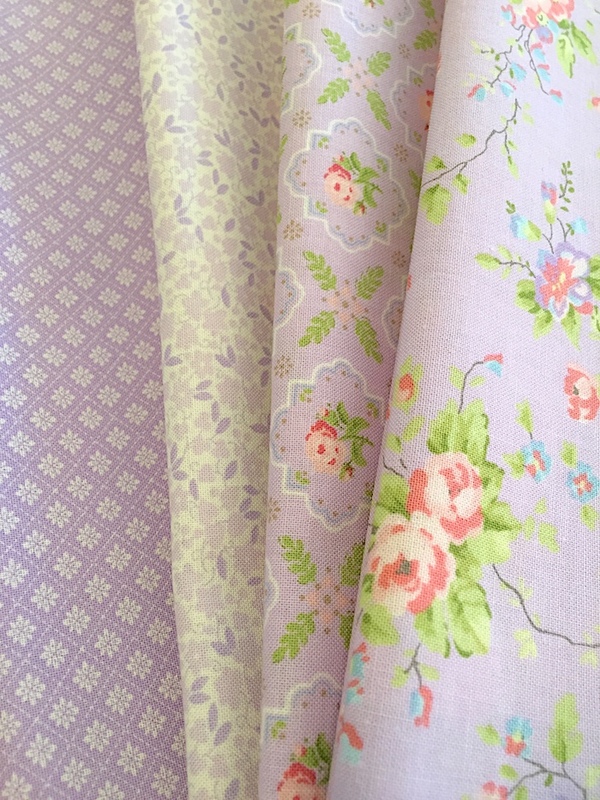 I almost forgot to mention - I've also ordered fabrics for backing for Betsy's Closet & Floye's Garden... 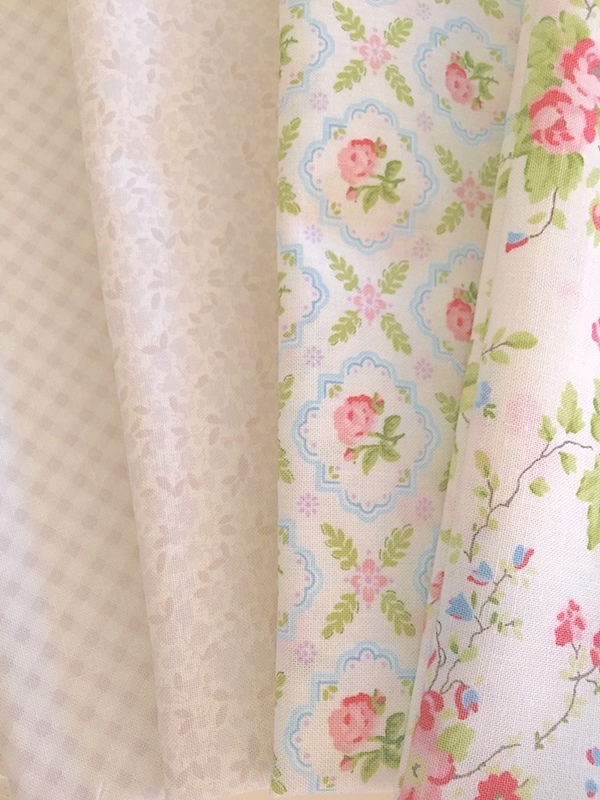 If you preorder a kit - you can also order the fabric backing of you wish! Well... I'm off to get a in little more sewing time. I won't be going to Fall Market this year - so I'm keeping myself busy with some new designs & putting together lots of fun things for the web-shop. It’s been awhile... I know. A few posts ago (when there had been quite a spell between my postings), I apologized & promised that I would be posting more, & more often. Life has become increasingly more complicated over the last few years - & so recently, with one more life event coming into play, I decided to make some changes. Changes that I think are for the best overall. To play a little ‘catch up’..., my father, who turned 90 last January, lives with me. While he has been doing great for a man of his age, this past June he had to have emergency surgery, & it has taken a toll. He’s working hard to regain strength, but there is a marked difference. He’s now using a walker, & was told by the doctor that he didn’t want him driving, & that has been a hard pill for my Dad to take. But, I’m just so thankful that he's here at home & I can check on him easily. It’s been a great chapter - but with the changes at home, I know that it’s time to leave the part-time job. While I love the folks I’ve worked with, I know I want to be home. Available for my Dad. 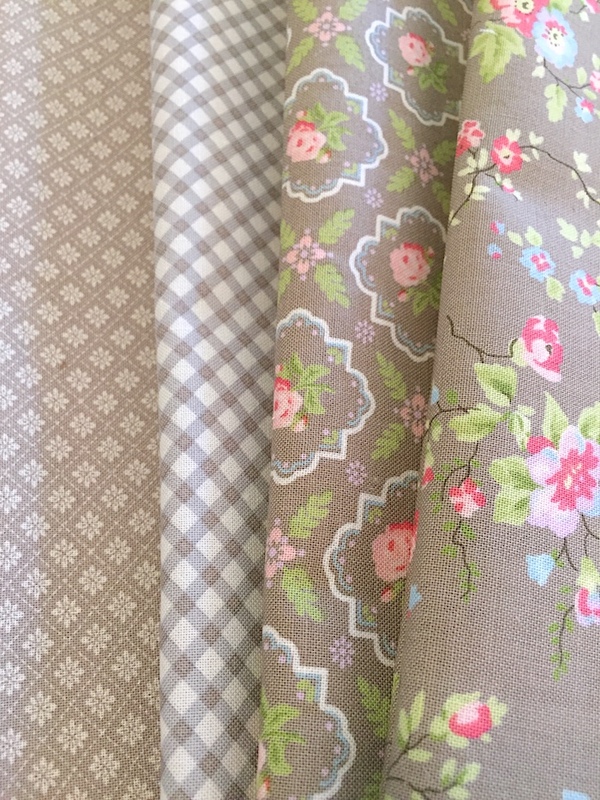 Also, I started the part-time job just before my first fabric collection, Ambleside, came out with Moda, & I’ve always felt that I’ve had to put so many things that relate to developing my own business on the back burner. So, It will be so wonderful to get to focus more on designing more, & building up my little website shop. 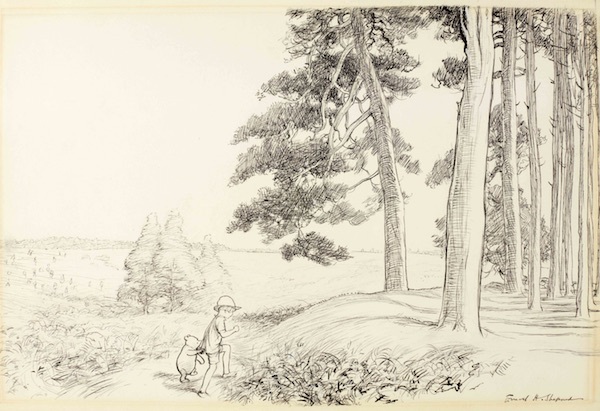 I’ve got so many things that have been floating around in my head for the past few years - that I haven’t had the time to develop & follow up with... so I’m looking forward to working on some of those projects. So, there are some changes in the wind. And, while I know some changes can take some time, I’m hoping that this change - of me being more present here on the blog - will be a good one... one that you will enjoy.